Some friends of mine are planning a fabric intervention, but I keep telling them I'm fine, I don't have a problem, and I can quit anytime I want to. Meanwhile, thought I'd share one of Saturday's purchases with you. I stopped at some shops I hadn't yet visited this weekend and really enjoyed the time I spent at each. This little bundle of goodies came from A Touch of Amish in Barrington, Illinois. Charming downtown to lose yourself in for a day, if you get the chance. But I was there on a mission--I took a class a year and a half ago from this shop, but the class was offered in northern Wisconsin, so I never actually went to the shop. The finished project from that class is now with its rightful owner in Mishicot, but I might resurrect that pattern again for another baby quilt I need to make. Don't know yet if that will be the pattern or not. 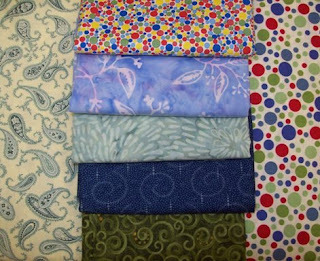 But anyway, the two fabrics on the sides of the photo I bought in yardage--the dots because I loved then and the paisley because it was the end of the bolt (or was that the other way around). The others are a mix of fat quarters and half-yards. Yes, the top one is the same pattern as another one I bought recently, but that one was pastels and this one is in primary colors. An intervention may indeed be called for though I must admit that I thought of you when passing the small quilt shop in Waupaca right at the intersection to head toward Scandy. I said to my passenger, I bet Linda's been in there. Hmmm. In the meantime, until you can't get into the house because of the fabric stashes I'll hold off those planning the intervention.